As I mentioned in the previous post, I am in India for two weeks with students from the US. The students arrived a week before I did, and have completed their second week here. This past week, we spent about three days in Ahmedabad at the Environmental Sanitation Institute, a Gandhi-inspired organization designed to promote health literacy in urban and rural India. After that we departed for Mumbai (where I’m writing this post), the Indian city of dreams, home to some 20 million people from all over India (and, of course, the world). I don’t have a single theme or thread to explore here – and, sadly, no pictures at the moment, as internet connections are unreliable and slow – but I did want to share some moments that have stuck out. One highlight has been my work with the students. They have a wonderful dynamic between them: they are supportive, inquisitive, and caring. They jump right in to projects, whether they may involve heavy physical labor (as it did for some students at a government school in Ahmedabad), listening to too-long talks from meditation teachers, or making their way through the heat and humidity of pre-monsoon Indian weather to visit village community centers and health organizations. I continue to be inspired and humbled by my work with them, and am eager to continue it this fall. Their blog posts have been just great. Check them out here! I’ve also been struck again by just how difficult it is to do this kind of work well. When I say “this kind of work,” I mean the act of taking students from the US (and other countries) to a place where most of them don’t speak the language, where we try to learn and work in communities…and to do so without doing more harm than good. There’s an excellent article published by the Stanford Social Innovation Review, “From Service-Learning to Learning Service” that I would like to reflect on once the trip is over in light of this experience. The article is not too long, and well worth the read. In other news, I managed to walk into a plate-glass window one night. My forehead had a bump for days. I will be more than happy to write a letter of recommendation on behalf of the person who cleaned it so effectively. My apologies to him or her for leaving small parts of myself all over their previously-clean window. A different kind of challenge is the staggering sense of scale in India, with over one billion people. We spent some time visiting with the Parthenon Group, an educational consulting firm that has a large presence in Mumbai. They told us of the need in the coming years for 40 million additional seats in colleges and universities. 40 million. These numbers seem daunting from a construction perspective, to say nothing of the teaching and pedagogy perspective. I hope to reflect here a bit as well, especially because our speaker from Parthenon, Karan Khemka, emphasized the importance of for-profit education in Indian college education. Such efforts have had very mixed track records in the US, but he seemed quite positive about its possibilities in India. The students have also had a chance to explore design thinking, using a process known as Design for Change. The Riverside School in Ahmedabad places a great deal of emphasis on this kind of work, and our students were able to work alongside their students for a weeklong project in a government school. (Most of this work happened during the first week of the program, so I only caught the tail end of it.) One of my former employers, the Riverdale Country School, also emphasized approach to social change, although the work was more with faculty than students when I was there; it was in the process of being introduced to students. Our students found the idea of thinking for change to be a powerful one. The idea of following certain discreet steps seemed compelling to them, and while we haven’t used the language of thinking routines on this trip, it is an example of one. We had a wonderful dinner in Mumbai hosted by a family with longstanding ties to our program. And there we heard from several speakers on leadership. One woman, Vandana Goyal, is the CEO of Akanksha, an educational organization in India that has recently begun opening schools there in addition to its rich after-school and co-curricular work with students. She spoke about authentic action and leadership. In fact, her final words to the students were her recollections of some words she heard that had stuck with her: “take responsibility.” She said that the speaker didn’t give additional commentary (when, where, how, etc. ), and that, in that spirit, she would leave the phrase open as well. It was a powerful moment for all of us – to whom am I responsible? How, then, should I act? Another moment of note was when Siddharth Sthalekar, who works at an organization called Moved by Love and has also volunteered extensively at the Seva Café, a pay-it-forward type of establishment. He spoke about a quotation from Vinobha Bhave. Bhave lived during the 20th C and was a very close disciple of Gandhi who started the Bhoodan Movement, which persuaded wealthy landowners to voluntarily give some of their land to landless groups of individuals in post-independence India. Siddharth spoke of a quotation from Bhave, who said that leadership had often in the past looked like a night sky with a full moon: one light was so bright that it outshone or dimmed the others. For the 21st Century, however, Bhave foresaw a world that looked more like a moonless sky, with many, many individual stars each shining brightly. This may be the case. But I worry that in my teaching of the 20th Century, there is a default to full-moon pedagogy. Of course our students can name Gandhi and King. But can they even name Vonobha Bhave, to say nothing of Tagore, or Nehru, or Jinnah, or Sardar Patel, or Bose – or, of course, countless women involved in the freedom struggle. Same with the US. Of course we know MLK and Rosa Parks. But do we know Diane Nash, or John Lewis, or Jim Farmer, or James Lawson? We’ve done some singing on this trip, and I was a bit surprised that students weren’t too familiar with Pete Seeger – the role that music can play in community action and nonviolence. The other Gandhian-related item of note comes from the Ahmedabad airport. Airport stores often seem to be repositories of crap: in Milwaukee, one can get almost any item made from foam cheese. Not just the traditional cheesehead, but neckties and beer holders and many other things, in addition to shirts about cow tipping and the like. Less than ideal. So perhaps it shouldn’t be too surprising that there were similar Gandhi-themed items in this airport. 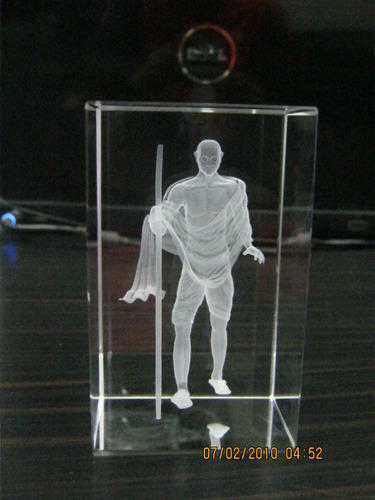 But these laser-etched Gandhi crystals certainly stood out. M.K. Gandhi is, without question, a difficult figure to grapple with. Students I’ve worked with have often struggled while reading his Autobiography, many have found his ideas foreign and inaccessible, others have been troubled by his poor relations with his family. Many, of course, have been deeply moved by his truth-seeking attitude – one in like with great philosophers such as Socrates and Malcolm X. They also deeply admire his willingness to live his life as a series of experiments, to try and see for himself with compassionate and nonviolent action looks like in a range of complex social and political situations, and to try and always maintain an attitude that refuses to dehumanize another person. All well and good…but Gandhi crystals? This seemed a bit much. Vegetarianism is difficult. Meditation and prayer are difficult. Fasting certainly is difficult, as is celibacy (two passions of Gandhi). So are small efforts at less harmful action in our daily lives, even on a quite small scale. And while it can be hard to divine what Gandhi might think about some issues – WWGD, I suppose – I can imagine that he would prefer an individual to try and put his teachings in her heart, and not on her shelf. This entry was posted in India and tagged Akanksha, Andover, Gandhi, India, Niswarth, Vinobha Bhave by teachingasianreligions. Bookmark the permalink.